First, I'd like to apologize for the last interview. As a well-known blogger, I consider it one of my most important duties to ensure that my guests don't get eaten by plants. So I've taken some precautions, and I'd say this week, as Retired Geezer from Blog Idaho joins me, he's got an 80-85% chance of making it home alive. Maybe as high as 87%. Retired Geezer is a gun-toting maniac from Schnoors, Idaho. He moved from Las Vegas to Idaho after an exciting tour as a lightman for such performers as Paul Anka. Rumor has it he was forced into retirement after he "made a maniac" out of Anka, thinking as many as eight things in a single night. More recently, he has been hanging with the jet set of Idaho, including Lyle, the old farmer who shot a cow in front of a bus full of school children in Napoleon Dynamite. Sobek: Now unlike most of my previous guests, Retired Geezer was actually considerate enough to send me a picture of himself for this interview. (It was really big, though, so I had to crop it a bit). Welcome, Geezer. I like your hairstyle. Sobek: Huh? Oh, sorry; I'll change it. You know, you don't look nearly as old as your 'net nickname suggests. Sobek: Oh, for cryin' out loud. I'll just post the whole picture ... GAAAAAH!!! Geezer: Something stuck in my teeth? Sobek: I realize this is kind of a personal question, but how old are you, exactly? Geezer: Five hundred and forty-seven. Sobek: Wow, that's pretty old. Geezer: Well, you're an ancient crocodile. You're got me beat out by three millenia at least. Sobek: Yeah, but I know all about mummification techniques. Sobek: So, are you enjoying retirement? Geezer: For the most part. I mean, I still like to do the stuff I did when I was younger, like drink an entire bottle of Scotch while polishing my shotguns. It's just that now, I drink the shotgun polish and the Scotch. Geezer: Don't you judge me. Sobek: Hey, I didn't say anything. Geezer: You were thinking about it. Sobek: Okay, look. I don't want this to get all confrontational. If you just want to pick a fight, I'm going to have to ask you to leave. Geezer: I ain't going nowhere. Sobek: I'm afraid you leave me little choice, then. You see, I suspected we might face such an eventuality, so I arranged for a guest-interviewer, as well. 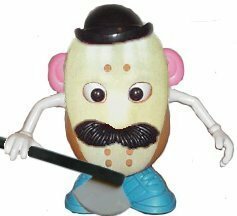 Serial Killer Potato Head: [Scary potato sound]!!! Geezer: Oh no! It's every Idahoan's worst nightmare!!! Geezer: Call him off! I swear I'll be good! Sobek: All right. Actually, I'm glad you backed down. You see, I promised at the beginning of this post that I'd try to protect my guests from being killed by plants, but is a harvested potato still considered a "plant"? Sobek: Well there's a good chance the Idaho state legislature has something to say on the subject. Fortunately, I happen to have a copy of Title 22 of the Idaho Statutes here, and Chapter 5 is entitled "Seed Potatoes." Geezer: It's lucky you have that book with you. Sobek: Sure is. Anyway, it looks like your state legislature has definitions for "certified potatoes." You actually need a commission to determine what is and is not a potato? Sobek: Huh. Here we are: Idaho Code 22-501(6): "'Potatoes' means potatoes (Solanum tuberosum) that may be sold for or used as seed potatoes." Well that doesn't really help, does it? Geezer: Actually, if we're going by taxonomy, the species solanum tuberosum is in the kingdom Plantae. I guess that means it's a plant. Sobek: Ah, but here in 22-503(1) it begins: "All potatoes offered for sale, sold or delivered under contract or distributed into or within the state of Idaho for planting in the state of Idaho ..." If it has to be "planted," then it isn't yet a "plant," now is it? Lyle: Maybe I can be of some help here. I was one of the principal drafters of the Idaho Seed Potato Act of 1996, so I think I speak with some authority when I say the legislature never intended that language to exclude harvested potatoes from the general classification of "plants." Lyle: Yes. In fact, I've served as a Seed Potato Arbitrator, pursuant to IC 22-510, for the past 12 years, and I can say with confidence that Title 22 has never once been used to designate potatoes as anything other than "plants." Sobek: Even for purposes of whether or not I should let an axe-wielding potato murder Retired Geezer? Lyle: For a more complete foundation to that issue, I would recommend checking Blackstone's Commentaries, because you're blurring the line between horticultural regulation and common law murder. Geezer: Maybe you should play it safe and just not let Mr. Potato Head murder me. Sobek: On the other hand, maybe I should play it safe by letting him eat you. Geezer: Oh my, look at the time. I'll see you later. Sobek: Take care. You should get the bill for my legal research in two or three weeks. Actually, I was planning on interviewing Michael, from Michael's Comments, but he claims he's a commenter, not a blogger. You can see my dilemma, right?